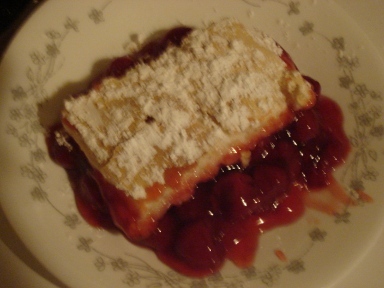 This is one of my easy gluten free dessert recipes that you can make in minutes. It is quicker to make and much less work than cherry pie, but just as satisfying. Great for company or for whenever you want a treat! Blend the above ingredients together in a bowl until smooth. Butter (or use margarine) bottom and insides of a 5x9 glass or metal loaf pan. Empty contents of one can of cherry pie filling into the buttered pan. Spread it to make it flat and even. Spoon crust mixture onto top of pie filling, leaving a 1/2 inch space around edges of pan. Even out to make a flat crust. Put pan into preheated oven and bake about 35 minutes or until crust is golden brown. Let cool about 15 minutes. Sprinkle top with confectioner's sugar. Serves 4-6. If you want to make more servings, the recipe can be doubled but will need 2-3 cans of pie filling, about 2/3 to 3/4 cup milk, and bake 45 minutes in 9x13 pan. 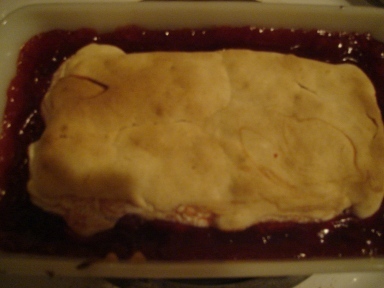 I hope you will enjoy this gluten free cobbler. It is a great gluten free dessert.